Another Rockman Xover update is upon us, and this time users can dive in to World 10 -- a Mega Man ZX inspired world. Of course, what's a new world without a new armor? 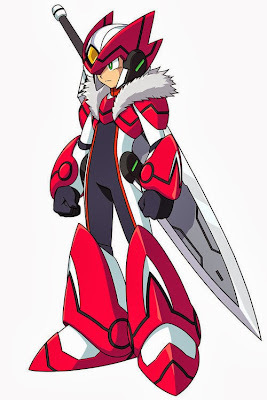 World 10 is accompanied by OVER-Z, a special Zero themed armor. Looks pretty slick, wouldn't you say? Hit up The Mega Man Network for more images and details. Oh god I still want this game orz. I was hooked playing this game back then, when android version was released, but honestly... meh, it was more addictive than entertaining, like candy crush and that crap. As soon as I had to stop playing it, I never gave it a try a again. Huh. The fur actually makes sense this time. I...huh. Good job, I guess. Francis: "The **** is that thing between the ProtoMan armor and the new one?" Clucking Chicken: "I think maybe it's supposed to be a bad boxart armor or something." Michael Nguyen: "Looks like "ForOVER-Alone."" lol. Makes me wonder what people would say of Megapin in Mega Man Universe. For those who want to know, that's Yoshida, the main character from よしだ飼育キット, a Japan-only game. Hey that's pretty coo-nope. Feather boa.